This Polish film feels like a strange dream. Household furnishings appear in a vast desert, and people come and go, using and rearranging the furniture. 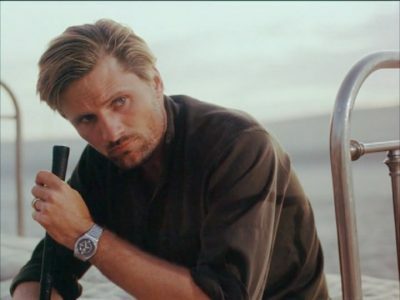 Viggo Mortensen plays Wes, who inhabits the bed, sometimes alone and sometimes with his wife Karen. Ewangelia wedlug Harry’ego was released in English-speaking regions as Gospel According to Harry. The film is a biblical soap-opera whose action unfolds in the Californian desert. Karen and Wes’s marriage is crumbling apart – like a sandcastle. Karen can’t even make love to her husband any more – the sand has managed to get everywhere. Harry, a tax collector, is a witness to this marriage falling apart. As a civil servant he hears Wes confession. However he isn’t able to help him. The omnipotent eye of television glitters above the desert – that raw allegory of America where neither the white nor the black have it good. If Samuel Beckett and Joan Collins had a romance, then their child would look like this film.